For almost 8 years now (whenever I was in High School it’s been a while) I’ve been watching YouTube for entertainment and how-tos. Split between Netflix and YouTube I started to crave seeing more faces that represented natives. When I started my search 4-5 years ago most of the videos I ran into about natives were documentaries, news stories., or compilation of pictures. Not very many vloggers, beauty gurus, or just other native faces the click on and watch and relate to. 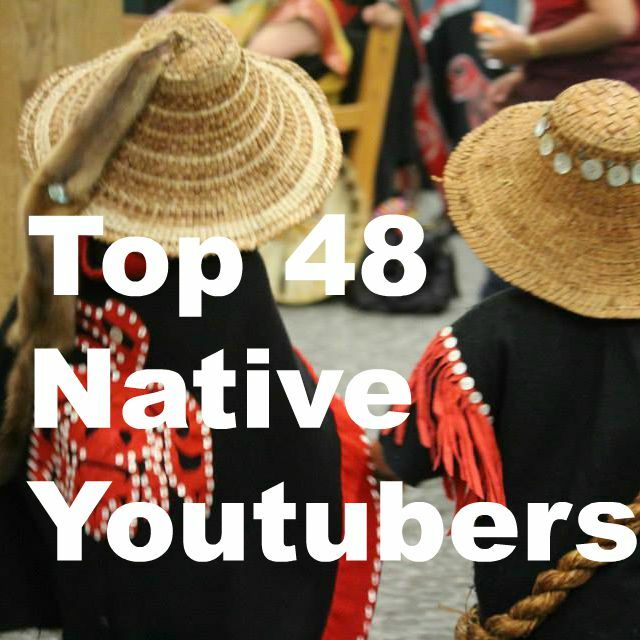 Luckily now-a-days there are more native faces on YouTube! Below are the ones I have been able to find and watch when ever they post! No order other than the categories. 😉 Subscribe to all of these! “Here you will find a variety of video’s, covering; pow wow’s, vlogs, events,and hand drum songs. My vlogs will be covering the everyday thoughts and concerns about education, life, family, and random ideas. Alaska Native. Native entertainment and discussion. ‘My name is Kristen Sally Dosela.. Call me Sally. Hey awesome people of the internet! You can call me JD and just for reading this I would like to say thank you and I hope all is well! 🙂 I consider this channel to be a hobby where I just have my thoughts and experiences to share. “I’m Athabascan, Yup’ik & Colville. I enjoy many different ways of expressing my creativity through my traditional and contemporary art. Experimenting with hair and makeup is also another form of self expression that I’ve always been drawn to. Haidawood makes stop motion animated movies in the endangered Haida language (Xaad Kil). “HI! My name is waȟaŋ ečhiŋ wiŋyaŋ (Mystic Wondering Woman) or you can call me Megan. Every week I throw out a Lakota word of the week video. I include the definition, spelling and a fun fact involved with the word. Thanks to Lakota Language Consor for the Lakota dictionary and providing the ability to self teach it. Be sure to check out their site to learn more about Lakota languages and be sure to check out my other sites as well for artwork and such done by me. Haida Langauge taught by Linda Schrack! “Gunalchéesh haat yigoodí! Lingít yoo x̱ʼatángi yís áyá yáatʼaa. Haa léelkʼu hás yís, haa yoo x̱ʼatángi sh too tooltóow. Haa dachx̱ánxʼi yan yís, yéi jigax̱toonéi. This is a channel dedicated to the speakers, learners, ancestors, and descendants of the Tlingit language. It is managed by X̱ʼunei (Lance A. Twitchell), Assistant Professor of Alaska Native Languages at the University of Southeast Alaska. This fall, arts education program Darkspark (www.darkspark.ca) teamed up with a large Grade 8 class at the incredible Quinte Mohawk School on the Tyendinaga Mohawk Territory. A grant from the Ontario Arts Council made the dream of producing, co-writing, recording and releasing an EP with a group of QMS students possible. These 12-13 year olds wrote with a single mission: inspiring change within their communities and their country. “Morgan Howard Productions is a full-service communication company with services in video, web, print and multimedia. We work closely with our clients; addressing their concerns and providing successful communication solutions. Vision Maker Media shares Native stories with the world that represent the cultures, experiences, and values of American Indians and Alaska Natives. If you are thinking about starting a YouTube channel please do! Your voice is important and someone will be able to relate to you. I personally have two YouTube channels snuck up in the list one for my native language and the other for fun and used to show what it’s like being native, learning my language, and just being a young person in my 20s. It has been a fun to share this with my family and friends. I’ve been able to make new friends through this too! Subscribe to all these channels if you don’t have a youtube here is a link on how to create an account! Please share your favorite YouTubers I need more natives to subscribe to! Hello. I was wondering if you might know how to contact Kristen Sally Dosela. I would like to have her permission to use one of her designs. Thank you. Hi! I am not too sure!